The PDP candidate stated this on Wednesday while addressing the business community in Lagos at an event themed “Getting Nigeria’s Economy Working : A Pragmatic Approach. I AINT SURE THIS WAS ATHIEFKU'S, APC ALLOW THIW MAN REST NOW..... WHY THE NIGHTMARES.... mtcheeeeeeeew. Who are his friends if not his family members? Once beaten twice shy. His case is pending with international bodies and the record of his loots can't be forgotten in a hurry. Atiku is just a continuation of the legendary corruption practices from the era of President Jonathan. Unfortunately, oil prices are at a low this time around. He is right though. I will also want to see my friends do well in life and I will try to help them to excellence by doing everything legally possible. However I won't support giving juicy positions to your friends from the North like someone is doing now. 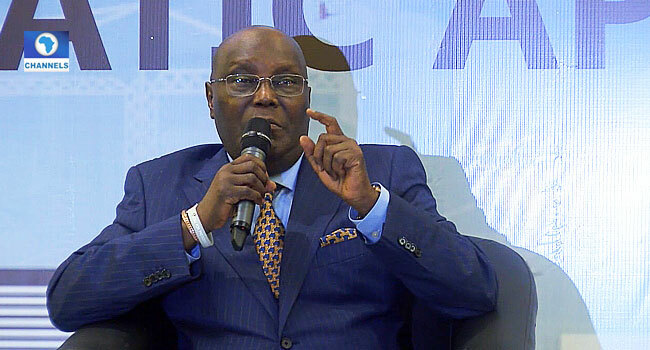 Now the fact that many poor suffering nigerians who are in the overwhelming majority will find no flaw in this unguarded outburst, instigated by desperation, but covertly reveals Atiku's main purpose for his presidential bid clearly shows the extent of both mental and leadership decay in nigeria. ...What am i even saying, i mean the man got accepted despite his criminal case in the US. I dont think any serious politician in nigeria would have boldly made this kind of statement in 1999 without some form of consequence. Now that is the level the present government has brought nigeria to. Gadamit!!! Such a bold display of malfeasance. Truly Nigeria has gone to the dogs. Criminals and murderers have a firm grip on the country. The people are still sleeping. The kind of atikulooting that will happen in nigeria should this man win will never have been witnessed in the history of mankind. We are all his friends right? Athiefkwu the rogue and corrupt soul. This is your friend aight?! Oh really? Is that your plan for NNPC? And where does that leave the rest of Nigerians that aren't your 'friends'? saraki, ffk fayoshe (aka athikus friends) will be salivating now. i pity nigeria's future if this rogue to enters aso rock. imagine selling nnpc to saraki and co. Simply put, I and my friend will plunder the country. And this is the rogue that some people want us to vote in as president. He can’t even hide the fact that he’s going to steal with his friends. Ole Jatijati ni bobo Atiku yi. Smh. No wonder in sarakis leaked audio he said and I quote "ATIKU WILL OPEN UP EVERYTHING". Tell us beta thing u won offer not all this trash abeg. Are my friends not entitled to be enriched? As long as there is no element of corruption there,” he said. Zoneb, use your sense It's not for fancy. Enrich his friends with taxpayers money? Yeye Dey smell. I sincerely pity those who think Atiku is a better replacement. Atikulated slaves are too busy kissing and massaging his balls to ask the thief how he intends to fix Nigeria all they care about is that their fellow flatheaded miscreant is VP candidate..I just hope their bitterness won't continue after 2019 when athiefku and Obituary lose the election.